Pricklypear, by nature, is notoriously slow to show symptoms, die and melt away. Faster symptoms with MezaVue® herbicide deliver a piece-of-mind benefit that the herbicide is working. Faster control means native grasses are able to respond sooner to get rangeland back into production. And, the more cactus you control, the more of that area you open to grazing. MezaVue® herbicide provides faster visual activity — so you can trust it’s working. But you also get a higher level of control with quicker speed of kill to help restore grass productivity sooner. Pricklypear treated with MezaVue shows significant yellowing — so you know it’s dying — within three to four months. This quick activity ultimately leads to a faster death. The sooner pricklypear is out of the way, the sooner desirable forage grasses can reclaim that space and begin feeding more grazing livestock. MezaVue doesn’t leave you wondering about your pricklypear control. First, there’s faster visual activity, so you know it’s on the job. And then you get more-consistent results, so you can trust MezaVue is going to kill more of the plants you treat. That’s especially true when treating individual plants, for which control can reach as high as 93 percent 12 months after application. When you treat for pricklypear, your aim is a high level of control. But, depending on your individual goals, preserving oaks, forbs or other desirable plants is important, too. MezaVue supports ecosystem diversity through tolerance among many species and a quick recovery by species exhibiting signs of injury. 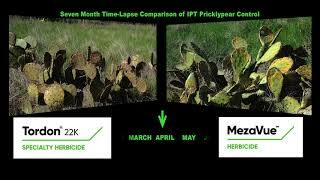 MezaVue Herbicide — The New Standard in Pricklypear Control When it comes to pricklypear control, you need to know. Pricklypear treated with new MezaVue® herbicide shows significant yellowing — so you know it’s dying — within three to four months. This quick activity ultimately leads to a faster death. The so NCBA's Cattlemen to Cattlemen -- A New Tool in the Fight Against Pricklypear Ranchers, researchers and land managers across the Southwest know how quickly pricklypear can gobble up grazing acres. New MezaVue herbicide delivers faster, more consistent results against pricklypear, so your grazing acres get back to producing valuable forages faster. Broadcast: 32 ounces per acre. Individual Plant Treatment: 1 percent solution v/v. Apply any time of year (avoid extremely cold weather). Ground broadcast applications: Spray volumes greater than 10 gallons per acre generally provide better coverage and better control, particularly in dense and/or tall foliage. Aerial broadcast applications: Use 4 gallons or more per acre total spray volume. Five gallons per acre or greater will generally provide better coverage and better control, particularly in dense and/or tall foliage. Individual plant treatment: Apply the spray mixture to individual plants until the pads and stems are wet, but not to the point of runoff. Results will be faster and more consistent if you spray both sides of the pricklypear pads. Looking for similar or complementary products? Check out these related options. ™®Trademarks of Dow AgroSciences, DuPont or Pioneer, and their affiliated companies or their respective owners. MezaVue is a Restricted Use Pesticide. GrazonNext HL, MezaVue and Sendero are not registered for sale or use in all states. Contact your state pesticide regulatory agency to determine if a product is registered for sale or use in your state. State restrictions on the sale and use of Remedy Ultra apply. Consult the label before purchase or use for full details. Always read and follow label directions.